There are three categories of Kenmore gas water heaters that we will review here; Power Miser, Power Vent, and HydroSense. All these Kenmore models come with a variety of capacities, powered by propane and natural gas and available for purchase at Sears. All Kenmore gas-powered water heaters are designed for potable residential water heating, while higher capacities including 74 and 98 gallons are for commercial use. They cannot be used in manufactured or mobile homes and for space heating. 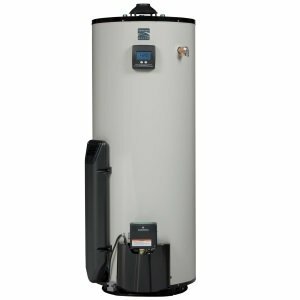 All residential water heaters are designed with tank capacities of 30, 40 and 50 gallons, enough for small- and mid-size homes and for families of 4 to 6 members. Power Miser series is Kenmore's most popular line with the widest selection of water heaters. There are also sub-categories including Power Miser 6, 9, and 12 with the tank sizes of 30, 40 and 50 gallons, including the warranty of 6, 9 and 12 years. All Power Miser models are equipped with the PEX Roto-Swirl dip tube, a self-cleaning system to reduce the sediment build up. To guard the metal tank against the aggressive water condition, these gas units are protected with a glass lined coating and one or two anode rods, depending on the model. For better protection against corrosion, models with two anode rods are coming with the warranty of 12 years. Models with the 9-year warranty have larger anode rods than the models with the 6-year warranty. A temperature and pressure relief valve is factory installed, so you don't have to worry about choosing the right TPR valve that meets the requirements and proper installation (per codes). Kenmore 50 Gal. 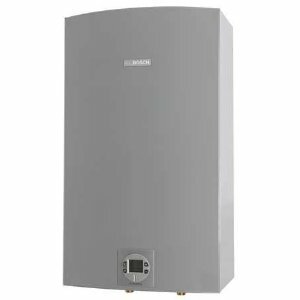 Tall Natural Gas Hot Water Heater (33157) - rated 4 stars, this standard size heater offers a 12-year warranty, with the two anodes for tank protection, Self-cleaning PEX Roto-Swirl cold water inlet tube and 2" energy efficient foam insulation. Kenmore 40 Gal. Tall Natural Gas Hot Water Heater (33147) is also rated 4 stars as the above unit, has the same specs, but a smaller tank. Kenmore 50 Gal. Tall Natural Gas Hot Water Heater (33205) - rated 3.8, this unit is the Power Vented model with the hot surface ignition and electronic temperature adjustment. Kenmore Power Miser 6, 30-gal models are designed as short and tall units, using natural and propane gas. Foam thickness on all 30-gallon models is 1" and has the insulation R-value of 8. Recovery rate at 90-degree rise for natural gas models is 36.3 GPH; the gas input is 35,500 BTU/hr and first-hour rating 67 gallons. Propane models have the recovery rate of 32.7 GPH and gas input of 32,000 BTU per hour. Kenmore Power Miser 6, 40-gal models can be found in two sizes, short and tall. Foam thickness on all 40-gallon models is 1" with the insulation R-value of 8. Recovery rate at 90-degree rise for natural gas models is 36.3 GPH, the gas input is 35,500 BTU/hr and first-hour rating 68 gallons. These 40-gal water heaters are also qualified as Energy Star models. Foam thickness on these models is 2" with the insulation R-value of 16. Recovery rate at 90-degree rise for natural gas models is 40.9 GPH, the gas input is 40,000 BTU/hr and first-hour rating 70 gallons. Kenmore gas water heaters that are with the Ultra Low Nox combustion and Energy Star qualified, have 40,000 BTU/hr gas input, 67 gallons for the first-hour rating and 41 GPH recovery rate at 90 F rise. Propane model is having a recovery rate of 36.3 GPH, first-hour rating 68 gallons and gas input of 35,500 BTU per hour. Foam thickness on all 50-gallon models is 1" with the insulation R-value of 8. Recovery rate at 90-degree rise for natural gas models is 36.3 GPH, the gas input is 35,500 BTU/hr and first-hour rating 83 gallons. Kenmore Power Miser 6, 50-gal, Energy Star models, come with the foam thickness of 2" with the insulation R-value of 16. Recovery rate at 90-degree rise for natural gas models is 40.9 GPH, the gas input is 40,000 BTU/hr and first-hour rating 88 gallons. Propane models have the recovery rate of 36.3 GPH, first-hour rating 83 gallons and gas input of 35,500 BTU per hour. When you buy Kenmore gas water heaters from Power Miser 6 series, Sears provides you with the 6-year warranty that covers the tank leaks or defected product and materials, as long as the product is installed properly and per codes. Kenmore gas water heaters parts are also covered for 6 years and 1-year labor. 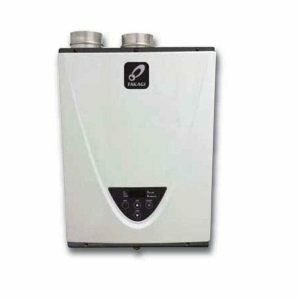 Power Miser 9 gas water heater can be found in two sizes; short and tall, with the tank sizes of 30, 40 and 50 gallons, where some are Energy Star qualified. For Power Miser 9, Sears provides 9-year warranty for the water heater tank and 9 years for the parts. Recovery rate is in a range from 36.3 to 51.2 gallons per hour at 90 F rise, the first-hour rating is up to 90 gallons for 50-gallon high-recovery tank model, and max gas input is 50,000 BTU/hr. As they provide 9 years of the warranty, the anode rod is larger in size than the one used for Kenmore gas water heaters with the 6-year warranty. Two models with a tank size of 40 and 50 gallons, from Power Miser 12 series are available, with a limited warranty of 12 years for a water heater tank and 12 for replacements parts. Both models are EnergyStar qualified. With two large anode rods installed against the corrosion, they allow Kenmore and Sears to provide such a long warranty; the tank is even more protected against aggressive water action. Both models are designed for 40,000 BTU/hr gas input and with a recovery rate of 40.9 and first hour 70 and 88 gallons. 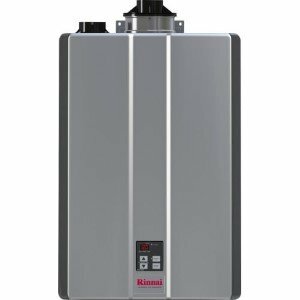 Kenmore gas water heaters from Power Miser series are designed to use a single pipe system, atmospherically vented with a minimum vent pipe of 2, 3 or 4" in diameter. This venting system is used to remove the products of gas combustion outside. Correct installation and per codes is a must for the safe, proper and efficient work of the water heater. Another way is to connect the venting system, vertical type B, to the lined masonry chimney with a proper draft. At the same time for the unobstructed water heater operation, sufficient air must be supplied for combustion, ventilation, and dilution of flue gases. By providing two permanent openings, the fresh air will be drawn into the room where the unit is installed, either directly from outside or from inside the building. For the proper piping installation, one of the requirements is that the water supply pressure should not exceed 80 psi. If the pressure is above, then the pressure reducing valve should be used. The recommendation is to insulate water pipelines to reduce energy loss and even freezing if the water heater is subjected to lower temperatures. For closed water systems install an expansion tank in the cold water line as the heated water tends to expand its volume, and to prevent an excessive increase in the water pressure, frequent discharge on TPR valve or even tank leakage. Temperature and pressure relief valve is provided with the water heater, and the properly sized discharge pipe should be installed. Kenmore gas water heaters are heating potable water only, and recommendation is to use copper, CPVC or polybutylene piping only. Power Miser Kenmore gas water heaters are using a White-Rodgers gas control valve with the pilot light to light the main burner and thermocouple as the safety element. By using the gas control valve you will be able to light the pilot flame, the main burner, set and control the water temperature. The pilot light is ignited by an electric spark generated when pressing the igniter button. Another safety element is a high-temperature limit switch, called ECO or Energy Cut Off switch that reacts if the hot water temperature exceeds 195 F, shutting off the unit. Power Miser models are using the FVIR system to reduce the risk of flammable vapor related fires, so all the vapors will burn inside the combustion chamber, not outside. This is done with the help of a specially designed water heater element, called flame-arrestor. The FVIR system will shut off the system in the case of the incident. Power vent models are designed as EnergyStar appliances in two sizes, 40 and 50-gallon. For lighting the main burner, they are not using a pilot light as Power Miser models, but hot surface ignition system. Products of combustion are forced out by power vent and through the PVC pipe installed through the roof or outside wall. Its main advantage is the intelligent diagnostic system used for troubleshooting and easier repairs and the electronic temperature control on a 50-gallon model. Max gas input they can get is 40,000 BTU/hr, with a first-hour rating of 69 and 83 gallons per hour. They come with a 6 plus 6 limited warranty. HydroSense series is constructed as 40 and 50 tank size water heater, and Energy Star qualified. First hour ratings are 67 and 90 gallons; max BTU is 40,000. It is equipped with the electronic control module a great and intelligent tool for error diagnostics and handy for troubleshooting. Thanks to the 2 anode rods installed, the warranty is 12 years for the tank and 3 years on replacement parts.